In case you haven’t noticed, I’ve been spending a lot of my time outside landscaping. What you definitely haven’t noticed… probably because I haven’t shared this with you before… is that much of my landscaping time is spent hopping up and down on my shovels trying to convince them to sink into the dirt. 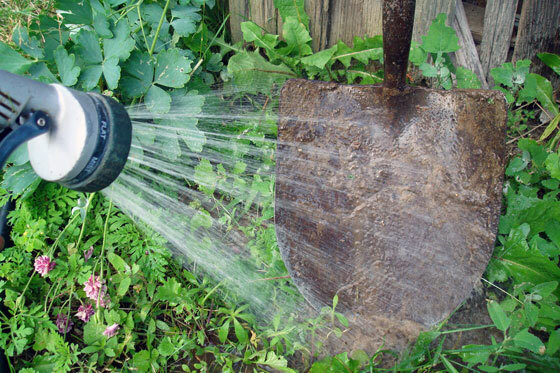 Or hacking away at defenseless plants trying to cut through tough roots. Obviously, it was time to sharpen my shovels. Past time, rather. The solution? Call my Dad. Unfortunately for me, the solution is never that easy. Fortunately for you, I now have another how-to to share. As soon as I pulled into the driveway at my parents’ house, shovels in tow, I realized that I was not going to be able to simply hand them over to my Dad. 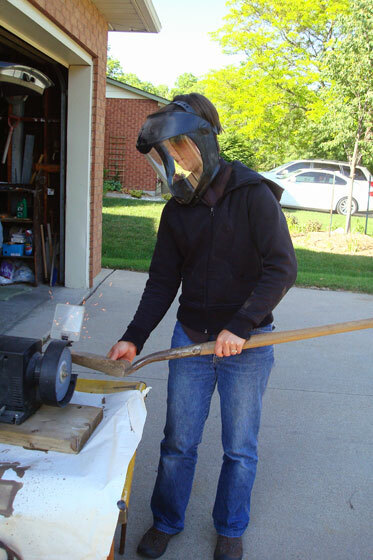 A whole sharpening station was set up in the driveway with a grinder, visor and safety glasses–multiple pairs. There was going to be a lesson. But first there was going to be a lecture. Fortunately–or unfortunately depending on how you look at it–my Dad did not take away my shovels. He did brush them off, but then he gave me a demonstration with one of his smaller shovels of how to sharpen them on the grinder. Most important lesson: keep your fingers out of the way of the grindstone. Keeping my fingers away was easier on my big scoop shovels when I could hold them by the handle. However, they were a little more unwieldy because of their larger size. Also unwieldy: my Dad’s visor which was not sized to my head at all, but did provide complete eye protection. 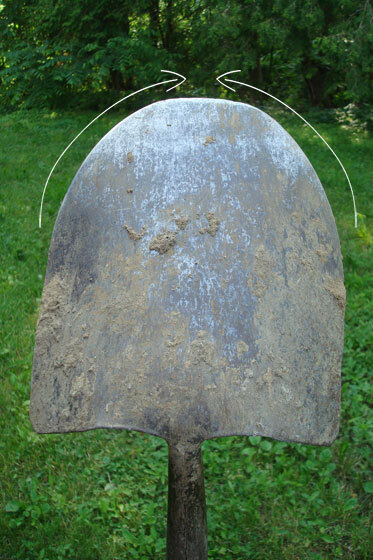 To sharpen the shovel, hold the back side of the blade at a very shallow angle against the grindstone. Start about halfway down the edge of the blade and curve around to the tip. Do a couple of passes on one side and then on the other. 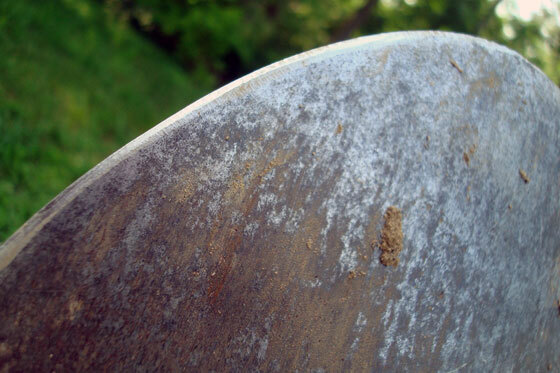 After running the shovels through the grinder a few times, I had a nice shiny, sharp edge. The shovels don’t magically become fillet knives, but they are much sharper and much easier to work with. Since sharpening, I have transplanted trees, bushes and flowers. Holes have been dug. Plants have been split, roots humanely cut with minimal trauma. Oh, and the shovels have also had a shower. 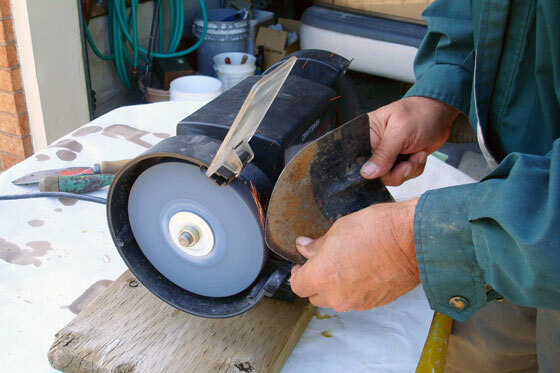 In addition to learning how to sharpen a shovel and remember to take care of my tools, I also learned why we used a standalone sharpening station set up in the driveway, rather than my Dad’s stable grinder that’s bolted to the bench in his work room. When the sharpening lesson was finished, he picked up the grinder and loaded it into my trunk. I guess this means I have to do it myself from now on. My Dad’s wanted to give me this grinder for awhile now, and it will definitely come in handy for us. Although it is yet another tool to take care of. Thanks, Dad, for the lessons and the tools. 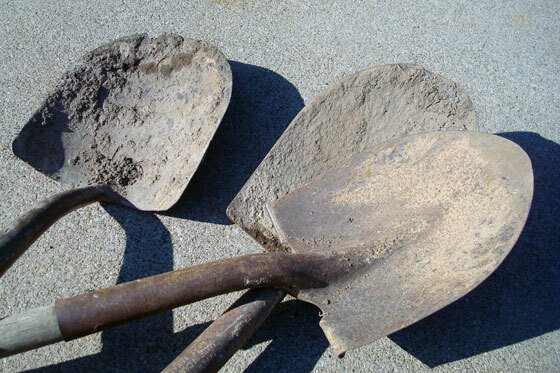 My father-in-law always kept a bucket of sand in the shed that he would shove most gardening tools into to get the last of the dirt off and then he would oil them so they didn’t rust – seemed like overkill to me, but his tools were always in great shape! He obviously didn’t need to learn my lessons. I’ve never heard of the bucket of sand technique. Thanks for sharing. Yay for a new grinder! Can you use it for lots of other things as well? I don’t really know what all I can use it for. Sharpening is the big one: axes, lawn mower blades, chisels, shovels. Lots of things we use regularly here. That will be really handy, then.